Lacrosse techniques can now be safely practiced indoors, so now you won't be limited by inclement weather or darkness. Simply the best way to get more repetitions: cradling, switches, dodges, jukes, fake shots, and fake passes. Cradlebaby increases training time and repetitions by allowing you to practice indoors or out, anytime. Lacrosse techniques can now be safely practiced indoors, so now you won&apos;t be limited by inclement weather or darkness. Simply the best way to get more repetitions: cradling, switches, dodges, jukes, fake shots, and fake passes. Cradlebaby increases training time and repetitions by allowing you to practice indoors or out, anytime. Lacrosse balls are heavy and have the tendency to damage breakable objects. 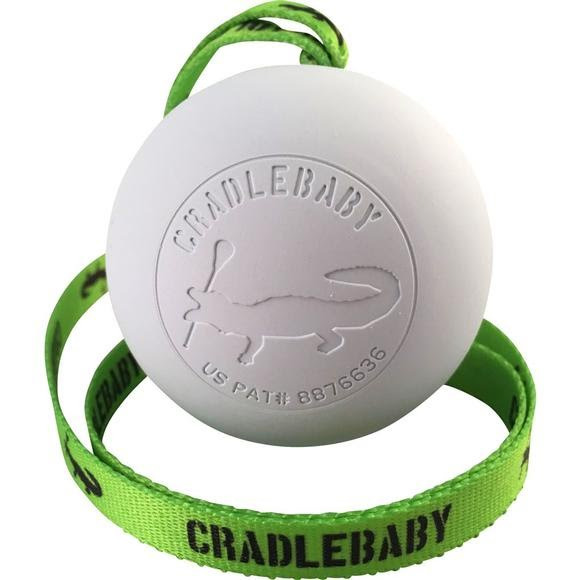 Cradlebaby keeps the ball tethered to the stick, ensuring that the ball will not inadvertently go flying through the air.